The government set aside a ten-acre site in Newtown and engaged the services of Danish-born architect C Julius Toxward to draw up plans for a larger and more modern hospital. 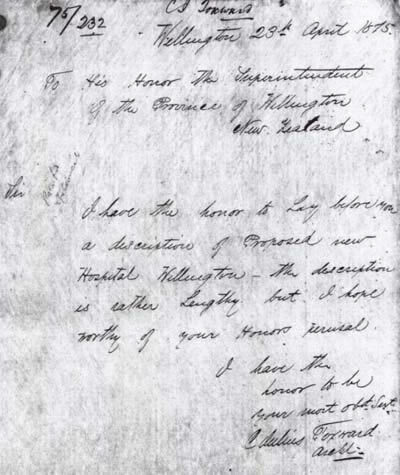 Toxward submitted his proposals for the new hospital to the Superintendent of the Province of Wellington on 23 April 1875. 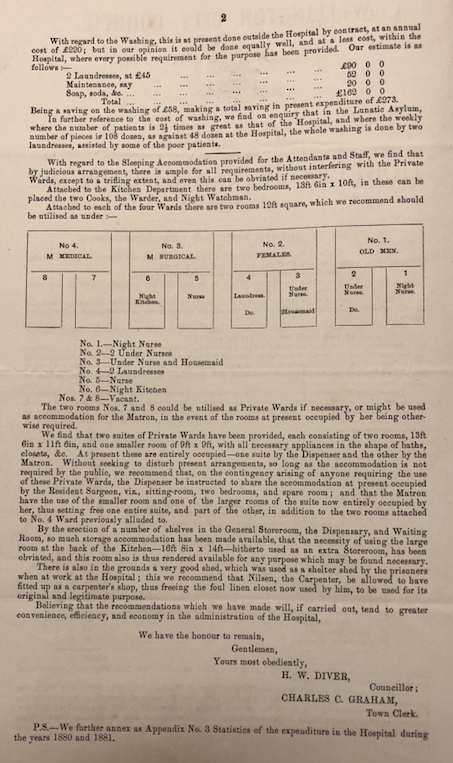 The full design proposals appear below, transcribed from a photocopy of Toxward's original hand-written papers, held by Archives New Zealand. The grounds occupy about ten acres, are situated on a rising surface, with plenty of fall for drainage, and are well sheltered from the south-east winds by a range of hills. The situation is a little beyond the Lunatic Asylum, and the grounds are entered by a road through a Government Reserve on the Adelaide Road. The main building has a frontage toward the west of about 280 feet in length, by a depth of 160 feet. The whole of the buildings are to constructed of brick and cement in the most substantial manner. The centre part of the building is to be two stories high, and measures 43 feet in height, surrounded with a balustrade from the upper floor. An entrance leads out to the top of porchway, also surrounded by a balustrade. The lower part of this building is for administrative offices, and the upper floor as a residence for the resident medical officer, the other parts to be one story all through. The plans are on the best approved principle, being on the Pasillion system, with abundance of light and ventilation. The main entrance is entered by a covered porchway, 16 feet wide, 20 feet long, and 20 feet high. On entering the hall, the main entrance is 12 feet wide by 38 feet long, divided by swing doors and large lights; to the left are the doctor's private consulting and examining rooms; on the right, waiting room and dispensary. Immediately on the right on entering the first lobby, a staircase leads to the upper floor. Passing through the hall, a corridor is met with, running at right angles to the hall, measuring 280 feet in length, 12 feet in width, and 18 feet high. On the west side of corridor, and north and south of the two story building, are two private wards, each containing two ward-rooms for two beds each, an attendants room; each ward has a fireplace and a bath room, also earth closet. The corridor is lit at each end by two circular headed windows, 7 feet wide, and 14 feet high; in addition to this, are six large circular headed windows; each side of the corridor has three pairs of double doors leading to the promenading grounds; from this side of the corridor, entrances are made to four large wards running at right angles, measuring 24 feet in width, 80 feet in length, and 20 feet high, having 12 large circular headed windows. The square portions of these windows are double hung, and the circular part hinged, so as to regulate the current of air. In addition, five fresh air flues are introduced under the floor, with corresponding outlets for foul air near the ceiling line, in the brick walls. Each ward has a fireplace and attendant's private room and scullery, so arranged as to observe the whole of the wards; the outside spaces between each of these wards are 52 feet wide, and 104 feet in length, having covered-in verandahs 8 feet wide all round, with concrete floors. These grounds are to be laid out for the promenading of patients, and will be formed into lawns, and planted with shrubs; in the centre of each a fountain could be erected. At the opposite ends of the large wards, and at a distance of 104 feet, running parallel to the main corridor, are two smaller corridors, 8 feet wide and 140 feet long, leading to two dining rooms, each 16 feet by 80 feet, and 16 feet high; at the back of which, but disconnected with the dining rooms, are kitchen 33 feet long, 20 feet wide, and 16 feet high. In connection with that, is another block of building 36 feet long, and 33 feet wide, containing scullery and copper store rooms, and two bedrooms for cooks; at the back of these offices, in enclosed yard, coal shed, ash pit, and water closets. From smaller corridor, two buildings are entered, containing two plunge and two steam baths, with boiler rooms; also four other buildings 27 feet by 22 feet, and 12 feet high, each containing a passage in the centre, lavatories, hot and cold baths, and three compartments for earth closets, urinals, &c. The whole of these buildings are well lighted and ventilated, and form altogether, a compact quadrangular building. Abundance of hot and cold water will be laid on, and the whole of the building will be lighted with gas. 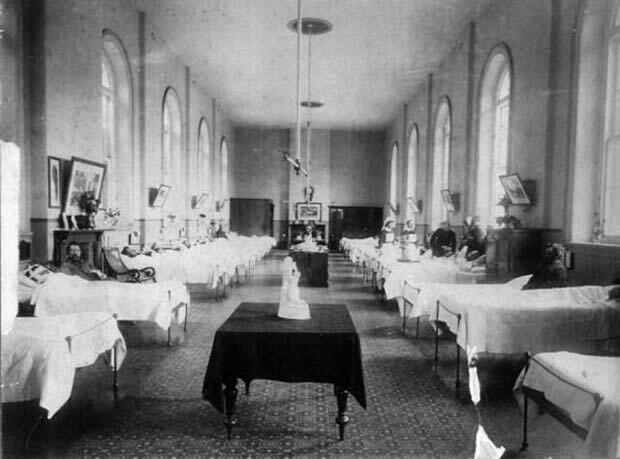 Detached, and at some distance from the main block of buildings, are the infectious or fever wards, for eight beds, measuring 32 feet long, 22 feet wide, and 20 feet high, with six large windows, and ventilated on the same principle as the large wards. In connection with these fever wards, is a front lobby, attendant's kitchen, lavatory, earth closets and urinals. At some futher distance is a building 42 feet long, 20 feet wide, and 15 feet high, containing dead house, post mortem examination room, fumigating room, and foul linen store. In addition to the above, are two buildings, each 34 feet long, and 17 feet wide, one containing wash-house with boiler, washing troughs, and laundry rooms. The other fitted for hospital stores, to contain linen, blankets, and store for patients' wardrobes whilst in the Hospital. All timber in floors and roofs (sic) is to be kauri, with the exception of the doors and windows; no other woodwork will be introduced in the wards and principal parts of the building. As a matter of cleanliness, all skirtings and architraves throughout, will be made of Keen's cement. All walls and ceilings throughout to be plastered. The whole of the roofs (sic) will be covered with felt and stout corrigated iron. The appearance will be of an imposing character. 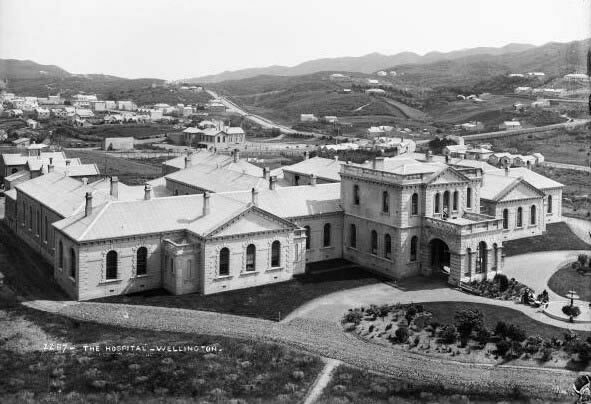 Among many benefits that the public will receive from such a complete institution, is one of immense service, namely, the fact that the Hospital will contain 112 beds, that number will entitle the Wellington Hospital to become a recognised Hospital, having the number of beds required by the Examining Board of the United Kingdom; which will enable young men to commence their studies for the medical profession in New Zealand, instead of having to go to England. Wellington, N.Z. C. Julius Toxward, Architect. " Work on the new hospital commenced in 1876, using prison labour. The prisoners were marched each day from the Terrace gaol to Newtown. The bricks were made on site from excavated clay, using a specially imported American machine. It was estimated that in the two years 1877 and 1878, some 4 million bricks were produced for the building. After the brickwork came the plastering, completion of which was delayed because of a shortage of plasterers. Some had to be brought across from Victoria, Australia. 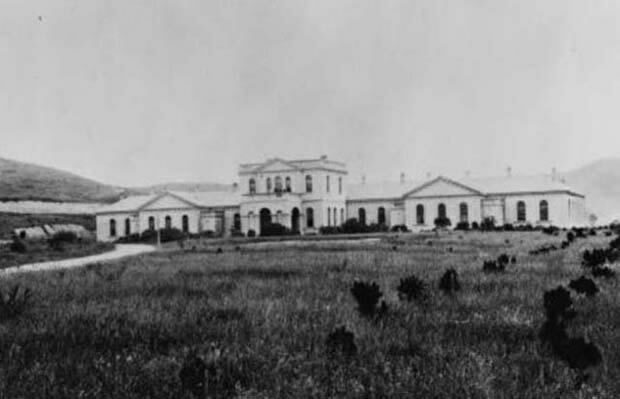 The hospital opened in 1881. A Hospital Ball was held to mark the opening on 20 June, and patients were transferred from the Thorndon Hospital between 27 June and 12 July. 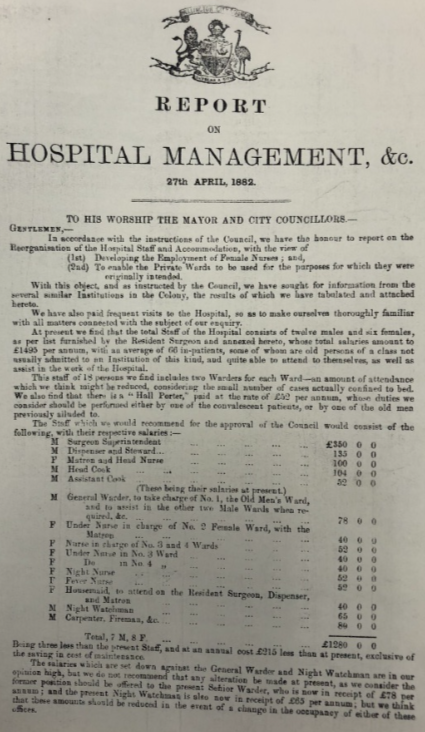 There were a limited number of attendants/nurses employed initially and they were resident at the rear of each ward. 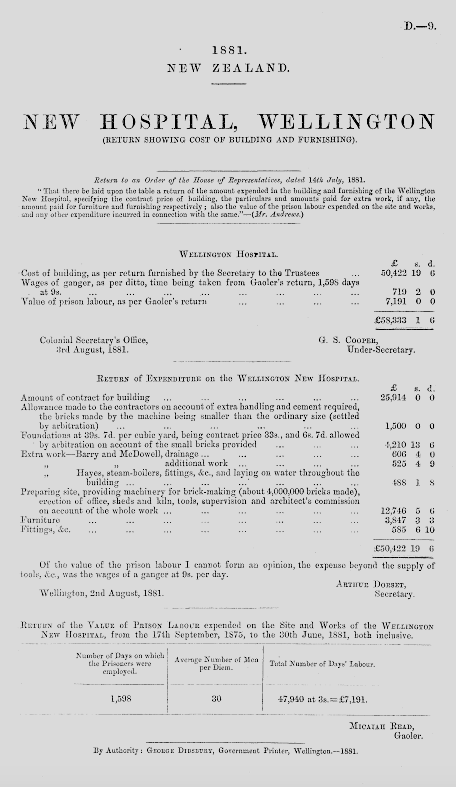 A report to the Wellington City Council in April 1882 looked at issues relating to staffing and how these might be resolved. 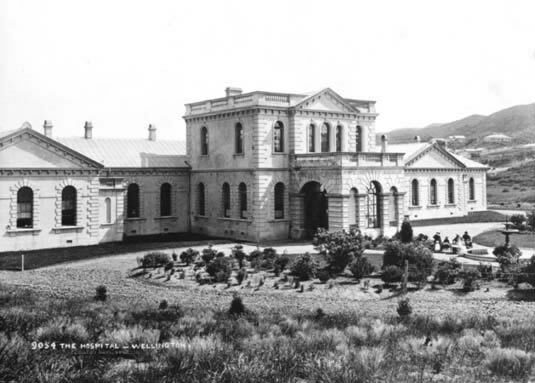 The hospital comprised an imposing front entrance which lead into a two-storey block housing administration offices, the casualty/operating room and the Medical Superintendent's quarters. Behind this, an equally imposing corridor ran in an east-west direction, from which four 24-bed wards extended to the south. The wards were numbered 1 through 4, Ward 1 being the most westerly situated. 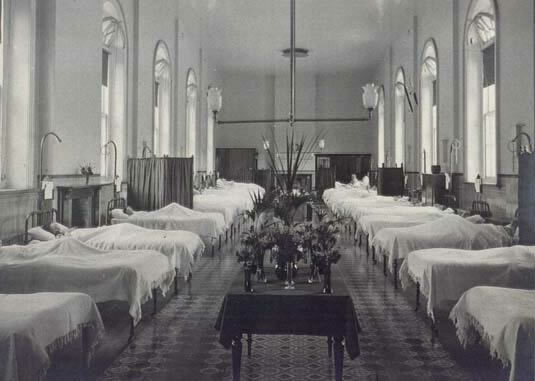 There were two smaller 'private wards' off the front (north side) of the corridor, each containing four beds, giving a total bed capacity of 104. There was a separate fever ward, remote from the main building, providing for another eight patients. The front entrance was reached by a sweeping driveway off Hospital Road. Patients and visitors alike entered the hospital here. This photo was taken in 1886. 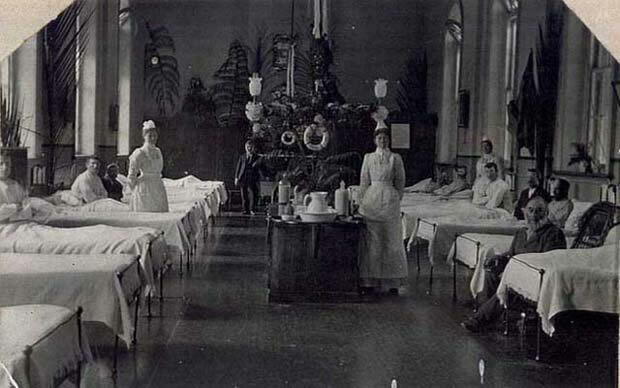 Each of the wards was of the 'Florence Nightingale' type - ie. the area for patients was a single open space with beds arranged along each wall. Ward 1, also known as Hinemoa Ward was the most westerly of the four wards. This photograph was taken in 1884. 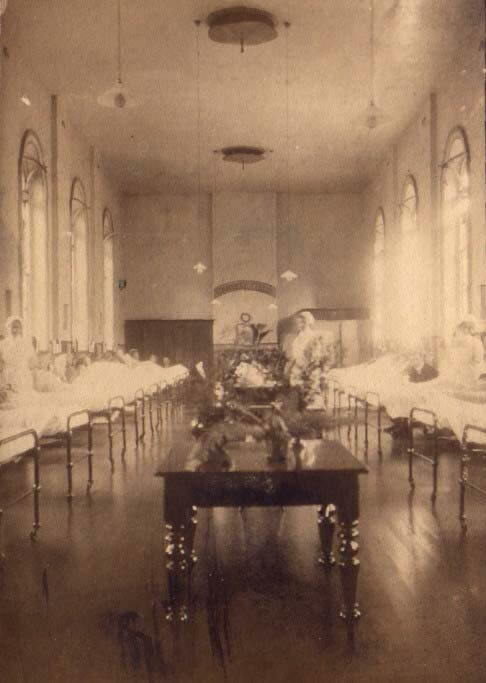 This photograph, taken in 1902 or 1903, shows the interior of Ward 3 decorated for the Christmas period. Ward 3 was also known as Arawata Ward. Ward 4 was originally known as Waiwera Ward and is seen here in this 1917 photograph. The space between each of the four wards was enclosed by the main corridor to the north, and a smaller corridor to the south. 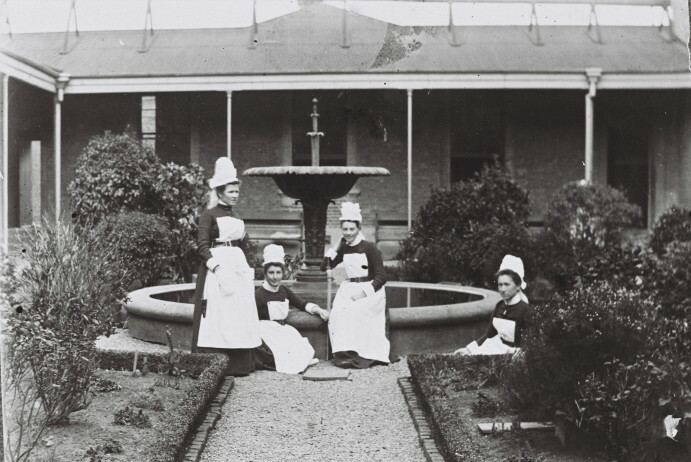 There were verandahs on each of the wards looking on to the enclosed space that contained a garden and a central fountain and goldfish pond. This photograph views the courtyard garden from the direction of the main corridor. A question often asked after completion of the hospital was, why had the four wards been placed to the south in the shade of the main corridor? The answer lies at least in part with the state of sanitary services in Newtown in the early 1880s. There was, in fact, no drainage / sewage system available in Newtown (that didn't change until 1888), so that at the end of each of the four wards were toilet blocks with dry earth closets and latrines, extending south of the smaller southern corridor and located 'out-of-view' from the public. Toxward had wanted the hospital to be approached through a garden / park - like setting from the north. 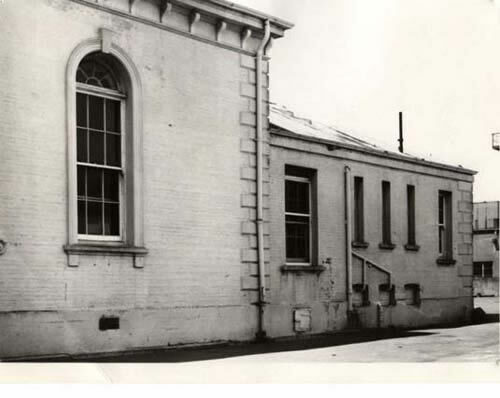 This photograph (taken in the mid 1960s) shows the toilet block at the southern end of Ward 1. Note the trap-doors (by now sealed) for the night cart. 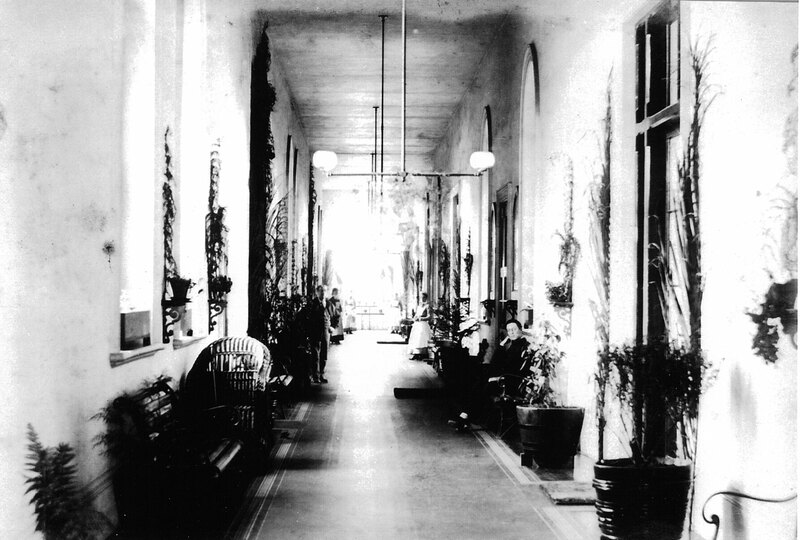 The main corridor was a dominant feature of the hospital, and in this early photograph was amply decorated with plants. Last updated 4 August 2018.